The Skutterchuck (エボシトバシ?, lit. : "Eboshi Launcher") is an insect-like enemy first encountered in Pikmin 3, and found again in Hey! Pikmin. The creature has a black wafer-like body with an orange underside. It has a habit of picking up certain objects (like crystal nodules and Pikmin), similar to Dweevils. It uses its odd shape to scoop them up and carry them around, and also for throwing its load at an approaching enemy. In Hey! Pikmin, it is slightly smaller and is brown. It simply walks forward, and when it passes through certain crystals, it will pick up a crystal nodule if its not holding one already. It can also now crawl under and on the sides of platforms, as well as above. Because they can crawl on the ceiling, they drop their crystals rather than throwing them when the player or their Pikmin are nearby. To do: find out its health in Hey! Pikmin by looking into the game files. The Skutterchuck is mainly passive, but when a leader or group of Pikmin gets close, it will try to attack. It attacks by picking up and throwing crystal nodules at its targets. It will also use its crystals as cover when being attacked, with the only Pikmin type that can break through being Rock Pikmin. When not attacking, Skutterchucks wander around in a small area, searching for nearby crystal nodules and picking them up if they have none, or fold in their thin legs and lie dormant on the ground with their crystal as protection and camouflage. If a Skutterchuck has no crystals to pick up, it will pick up and throw Pikmin into the air instead. If a Rock Pikmin is thrown at it and breaks its crystal, the Skutterchuck will quickly scurry away. A single Rock Pikmin is enough to destroy the crystal if it is thrown onto it. The Skutterchuck will flinch, and another thrown directly afterward onto the now bare Skutterchuck will kill it in one hit. The second throw should come quickly after the first one, as if there's too much of a delay, the creature will flee before the second Rock Pikmin hits it. Other Pikmin types can also be used to attack the underside of the creature. The Skutterchuck may shake them off and attempt to throw rocks onto them, but it rarely hits on time. This method takes a bit longer, and destroying all crystals with Rock Pikmin before killing the enemies leaves the Skutterchuck helpless. It is possible to take advantage of the Skutterchuck's attack, as if the player positions a leader near another enemy, the Skutterchuck will throw its crystal at the leader, killing or damaging the other enemy in the process. 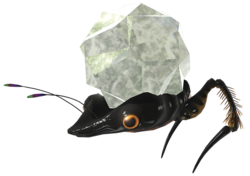 Unlike other enemies that use weapons like the Careening Dirigibug in Pikmin 2, the Skutterchuck is not immune to the crystal nodules it throws, so this can be used to kill other Skutterchucks if they are in the area, or even the Skutterchuck that launched the nodule. Some notes: Translate its Pikmin 3 internal name. "Skutterchuck" is a combination of "skutter", which is similar to "skitter", which in turn means "to run around quickly", and "chuck", referring to how it tosses rocks. Its Japanese name is エボシトバシ?, エボシ? is a black-lacquered headgear (made of silk, cloth or paper) originally worn by court nobles in ancient Japan and トバシ? is the sterm of the verb 飛ばす? which can mean "to fire", "to hurl" or "to launch". In Pikmin 3, it is internally known as iwakko. In Hey! Pikmin, its internal name is eboshi. Similar to all enemy internal names in Hey! Pikmin, it is a Romanization of the Japanese name, although it doesn't have the second word. Its generator name is enemy_hat_throw. This could be from how Skutterchucks hold Crystal Nodules on their heads like hats, and they will throw them to attack. A Skutterchuck in the Tropical Forest, a level in Mission Mode. A Skutterchuck in the rain. A Skutterchuck without a crystal nodule on its back. A Skutterchuck being scanned in an early version of the game. This page was last edited on March 15, 2019, at 17:21.